"It appears MacFarlane was determined to avoid making the same film twice by taking drastic measures to steer the plot away from the bromance versus romance conventions. Thankfully, the blend of warm story and icy humour that follows works to his, and the film’s, favour." After the moderate failure of his corny and lackluster western A Million Ways to Die in the West last year, acid –tongued vocal genius Seth MacFarlane returns to the foul mouthed stoner talking teddy bear to assert his razor-sharp sense of satire. Surprisingly, he appears to have pulled it off once again, with any shame of enjoying the edgier jokes swept away by a genuinely thoughtful story. The setup of Ted 2 sees Mark Wahlberg’s John Bennett divorced from Mila Kunis’ Lori Grimes. Meanwhile, Ted has married his girlfriend, although discovering that because of his status as ‘property’, he does not have the rights to get married, have a job or adopt a child. The duo then hire novice lawyer Samantha Jackson (Amanda Seyfried) to help prove that Ted is human. Bam – so everything that the first film set out to achieve – John maintaining a balance with his friend and his girlfriend – was all for nothing. A troubling scenario to enter a sequel in, it appears MacFarlane was determined to avoid making the same film twice, as he takes drastic measures to steer the plot away from the bromance versus romance conventions. Thankfully, the blend of warm story and icy humour that follows works to his, and the film’s, favour. MacFarlane, who in the past has been accused of casual racism, sexism and homophobia because of his various cartoons and previous cinematic endeavours, has been a supporter of gay civil rights and various other movements for many years. In many ways, he laughs at himself half the time, drawing out jokes in poor taste that exist in society and essentially laughing at them at the same time. The main bulk of the jokes in the film deal with black men and how much cannabis is consumed by the thunder buddies, in which MacFarlane is pointing out diversity in lifestyle and selling it as acceptable, which is to be respected. I’m generally a fan of the spiked sense of satire from MacFarlane’s work, and those spikes coat the film in a style about as in-your-face as you’d expect, with many cutaway gags and slyly delivered anecdotes to inject the tickles into your gut. At one point, mid-case research, we see Ted, his wife Tami-Lynn, John and Samantha throwing apples off a roof at joggers and cyclists, and the next scene we see them fighting for civil rights in a court. In any other way this would feel like a clash of taste, but it was difficult for me to be too hard on a talking bear (essentially slobbing around in his life) that made me laugh so many times up to that point. Granted, Seth MacFarlane’s comedic tone requires a certain taste, and if previously he hasn’t entertained you there won’t be a lot for you here. But to simply bash the film over the head for the occasional gross out moments and sharp stabs would be a surface approach. There’s genuine heart to be found here, one that’s not beating purely for box office economy, but for telling a worthy story whilst having a lot of fun in your own way during intervals. As for the characters surrounding Ted, Mark Wahlberg continues to embarrass himself in many ways when either drunk, stoned or miserable, but it’s good to see him trying and not to lose interest in himself in what is a more side-lined role than before. Amanda Seyfried securely fills Mila Kunis’ shoes, generating a stronger social connection to the duo, rather than Kunis’ evident social distance from the lifestyle. Patrick Warburton shows up two or three times, flaunting his character’s sexual orientation, not really contributing much to the story but bluntly bringing in some passable slapstick. There is also a certain celebrity cameo whose scene may be worth the price of the cinema admission alone. 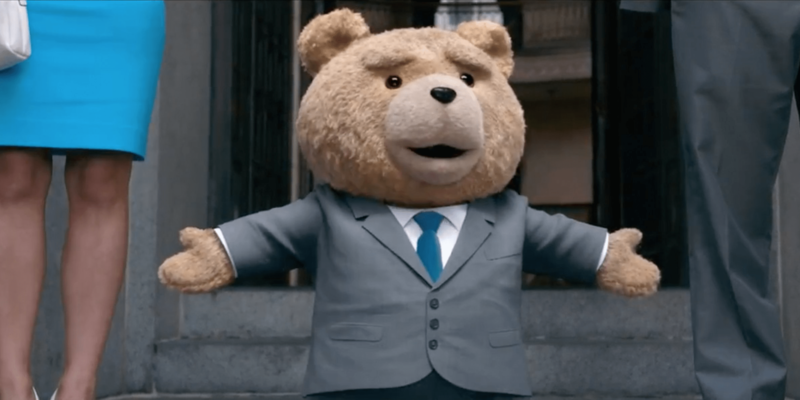 You can mock MacFarlane as much as you like, but when it comes down to it, he’s no cynic – Ted 2 finds the way to latch on to both a thoughtful story and satirical bite. If you didn’t laugh, don’t sneer, no one set out to offend. If you did, fantastic – the film achieved its aim.